A new documentary reveals America’s greatest entertainment: <br />A story of obsession, family, and faded glory—on ice. But there was no ice in Enid. It wasn’t until Blakey was drafted into the Army, during the Korean War, that he found his way onto a rink. He was stationed in Germany on an Army recreation base in the mountains, a kind of Bavarian wonderland of alpine entertainment: golf, tennis, hiking, and ice skating. Theatrical ice skating, as opposed to Olympic-style competition, was peaking in popularity, and every major hotel in every major city from New York to Japan had an ice show in its nightclub, while arenas hosted traveling troupes. Germany, even in wartime, was no different. “It was a magical, magical place,” Blakey says of the recreation center. He appeared in the ice shows there and became quite good. Good enough to join the Frosty Frills ice show at the Conrad Hilton Hotel in Chicago upon his discharge from the Army. Publicity photos from the period show the troupe, which performed with a live orchestra, cycling through one genre after another: baseball, Li’l Abner, Oriental. He skated for five years there, two shows a night, seven days a week. And then he hit the road. He had met a man from Minneapolis who ran the Holiday on Ice tours, and he signed on, performing in Asia, South America, and Europe—40 countries in six years. It was a circus-like affair, as the troupe took its own ice rink wherever it went, setting up in bullrings, Roman coliseums, wherever they could. Blakey, the kid from Enid, had the time of his life. As Blakey regales me with these stories, his niece, the photographer Keri Pickett, sits nearby. Her best-known book, Love in the ’90s, documented Blakey’s parents near the end of their 70-year romance. She has heard her uncle’s stories so often that she’s looking at me, not him, to see if they evoke the same astonishment. She has maintained a studio in this building since 1993, and her photographs—of Tibetan refugees, the Dalai Lama, Mikhail Gorbachev—cover the walls of the entryway. Blakey was the reason she got into photography, and now he’s the reason she has taken up documentary filmmaking. “I became a filmmaker just to tell this story,” Pickett says, nodding at her uncle. She has spent the past six years and a good deal of her savings making The Fabulous Ice Age, which she was invited to submit to the Tribeca Film Festival, held this month in New York, and the Minneapolis-St. Paul International Film festival, also this month. The film opens with Blakey talking about his childhood dream of skating. But Pickett found many more stories by knocking on doors that opened onto more doors, each with a former skating star in repose behind it. Blakey lives in this building, in the back—a magical kingdom of Asian antiques: intricately carved dressers, an immense sitting platform, wall-size decorations. His living quarters were profiled in the Star Tribune’s Homes section a few years back. But in the basement, and spilling everywhere else, is his collection of ice-skating memorabilia, almost certainly the largest in the world. Blakey began collecting soon after seeing that Sonja Henie movie in 1941. Now he has Henie’s costumes, white figure skates, and even her glittery bra, which he shows me with a mixture of awe and bemusement. There are enormous feathered headdresses and huge posters for ice shows in Germany, Russia, Japan, America, and elsewhere. There are programs from hotel revues, tabletop advertisements, publicity photos, promotional lunchboxes, toy figurines. It’s a fact that has motivated Pickett. Aside from the narrative pleasures of her film, it also serves as an advertisement: Stable home needed for memories, posters, shimmery bra. No skating experience required. To take the collection out of Minnesota would be to pluck it from its native habitat. Theatrical ice skating may have taken root in Russia, a cousin to ballet, but it flowered in Minnesota. In the depths of the Great Depression, a St. Paul rink rat named Roy Shipstad began staging impromptu ice shows on local ponds—cheap entertainment—with his older brother, Eddie, and their friend, Oscar Johnson. Johnson played the clown; Eddie was a slick Fred Astaire type, complete with top hat. They were a hit and took the act on the road in 1936. They were booked at a Chicago hotel as a “tank show,” and eventually became the best-known act in the biz: the Ice Follies. In 1945, another Minnesotan, Morris Chalfen, bought the rival Holiday on Ice enterprise and headquartered it on Nicollet Avenue in Minneapolis, just south of downtown. (He’s also known for buying the Detroit Gems basketball team and relocating them to Minneapolis as the Lakers.) It was with Chalfen’s troupe that Blakey toured the world. Pickett tracked down dozens of people like this from skating’s golden age who had melted into obscurity. Some have died since Pickett interviewed them. Her window of opportunity was closing as fast she could open it. “This may be the Ballet Russes of ice skating,” she says, comparing her film to the 2005 documentary about the Russian dancers who birthed modern ballet. Hardly anyone in either film is younger than 70 years old; most are over 80. When skaters die, Blakey generally hears about it. He has come into a lot of artifacts this way, though he admits feeling uncomfortable approaching survivors: “You can’t just say, ‘I’m sorry he died, can I have his stuff?’” Generally, he doesn’t have to. Word of his collection has gotten out, and every so often he’ll take delivery of box after box of costumes and programs and photos, and his space closes in on him a little bit more. 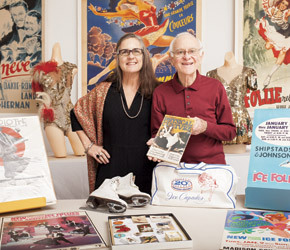 Last year, Blakey appeared on PBS’s Antiques Roadshow with his Sonja Henie costumes, and one of the show’s appraisers is visiting this spring to assess his entire collection. She may not know what she’s in for. Blakey once tried to catalog his collection, typing with two fingers. But for the past year, he has paid a college student, more versed in technology than he is, to come in a few days a week and take stock. Blakey didn’t always spend his time like this, living in the past. For most of his life, he was an active participant in the zeitgeist, first in skating and then in photography, retiring his cameras just a couple of years ago. In his studio, his previous life is manifested mostly in the framed photos on the walls of Broadway dancers and actors, and a wallet-size image, tucked into shelving on Pickett’s side of the building, of a hirsute naked man covering his privates. After retiring from the skating circuit in the 1960s, Blakey opened a studio in New York and became known for his pioneering artistic images of male nudes, compiled in a 1972 book, HE. “His studio was up a steep stairwell in Chelsea,” recalls one of his subjects, marveling at Blakey’s athleticism, “and he would virtually run down the stairs to let you in and then dash back up the hill like a little leprechaun.” Even with his skates off, Blakey moved as though on ice. By then, the ice age was melting. Competitive ice skating was heating up, narrated on television so that anyone could thrill to the pursuit of perfection. Flipping through a scrapbook from his Hilton days, Blakey recalls how spectacle was displaced by the dry drama of points, theatrical skating by its prim alter ego—“technical skating,” he says dismissively, not looking up from his memories. “Eventually, people cared more about the Olympic champions than some random Ice Capades girl.” The only touring theatrical troupes now are Scott Hamilton’s Stars on Ice and, in a kind of subgenre, Disney on Ice.